The featured photo isn’t an article but it is worth sharing. 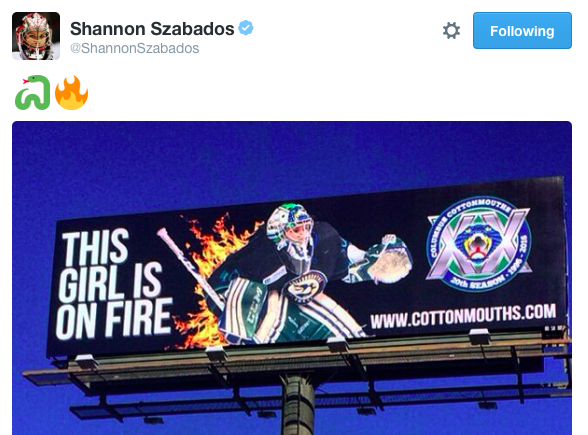 Big props to the Columbus Cottonmouths, of the SPHL, for putting Shannon Szabados on a billboard! Good news for Rogers, as the CBC Hockey Night in Canada faithful have slowly been shifting over to the Rogers Hockey Night broadcast [Globe and Mail], but then if you read this article it would seem that Rogers is still struggling [Yahoo Sports]. How are we to know which to believe? There seems to be some controversy surrounding the “soft” announcement of the CWHL/NWHL game during this year’s Winter Classic [Puck Daddy], seemingly partly caused by this article [The Hockey News]. While the many from the hockey world are thrilled to talk about Kane’s historic point streak, Phyllis Kessel asks us to take a step back and gain some perspective [Pension Plan Puppets], as does Paul Wheeler [Stanley Cup of Chowder]. [Sports Illustrated] looks at how the NHL has embraced participatory media by framing fans as “prosumers” who help to create a community and shape sports media. The NHL is still keeping a tight lid on any expansion news. [Puck Daddy] argues that Quebec City’s bid is not looking good. Last week, Patrick O’sullivan’s piece about his abusive relationship with his father took the hockey world by storm. Unfortunately, we found out this week that Alex Burrows decided to use that intimate information against him [Puck Daddy]. This should make us reflect on the idea of a “competitive edge” and the value of winning at all costs in our society. ← Camouflage jerseys: In support of, what exactly?